This is the continuation of a post I wrote earlier this month about the changes to Lower Marsh, a market street situated just behind Waterloo Station. I found a few of the old wooden market barrows near the pedestrian access to Leake Street. 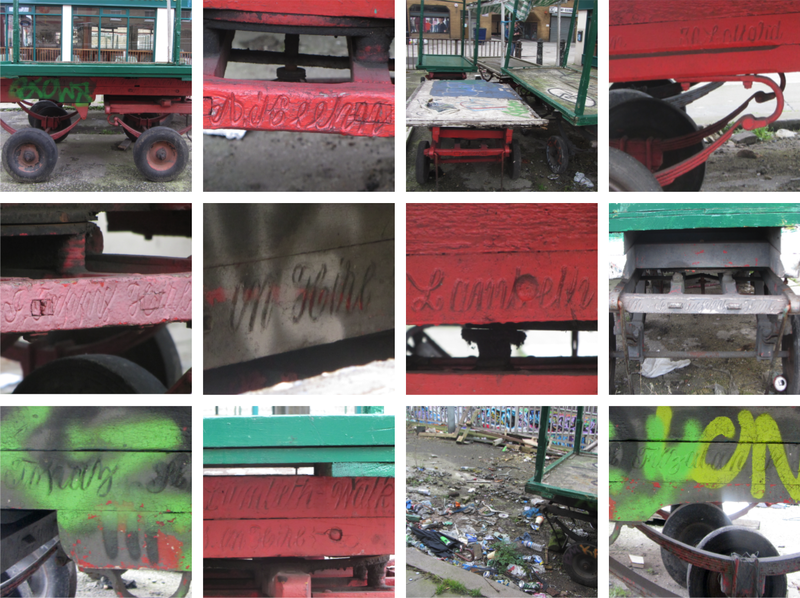 These once-loved and carefully maintained mobile market stalls are now sitting in amongst a lot of rubbish and hence have attracted the graffiti taggers. On closer inspection I noticed the original barrow owners' names and addresses or market locations carved into the wooden frames. And somewhere on every one: 'On Hire'. I am still trying to fully decipher some the names because the hand-carved scripts are hard to read – note the non-joined areas within the m and h of 'Lambeth'. Of the road names, Fitzalan Street (shown bottom right) is just a short walk away from Lower Marsh, ditto Lambeth Walk which was also a bustling market street decades ago but today shows no real signs of life today. But, so far, I cannot find out anything about Topaz Street, shown second on the bottom row. Holland St, top right, is a bit further away in Southwark at Bankside. The owners' names are even harder to decipher; possibly 'A Heehn' (second, top), A H Pelin (top right), M J Tala... (middle right). Any ideas? And how old are these barrows? When do they date back to? If they aren't going to be used any more what's going to happen to them? They are still used but the graffiti is a constant battle. 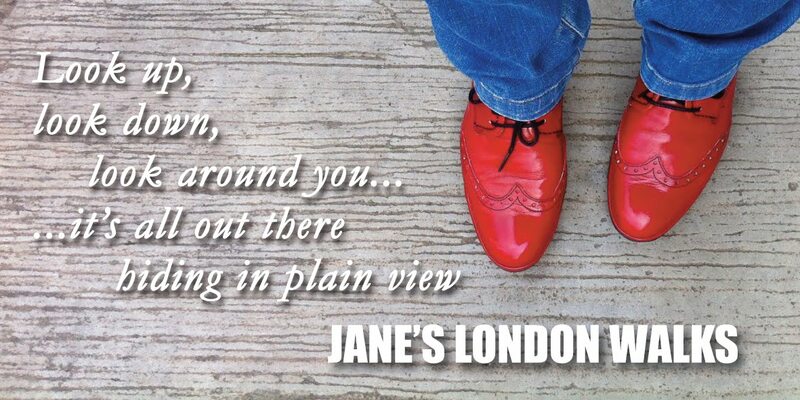 Hello Jane, love your blog, keep up the interesting work. From about 2012, I started a blog where I researched what was called the New Cut Market, that is now known as the Lower Marsh my old blog is here: http://newcutmarket.blogspot.co.uk/ Due to family, work and other commitments - I unfortunately had to give up the research as it took up too much time although, I still have the information ready to spring into action again should I get the time again. I grew up around the Lower Marsh and Waterloo and still have family there. 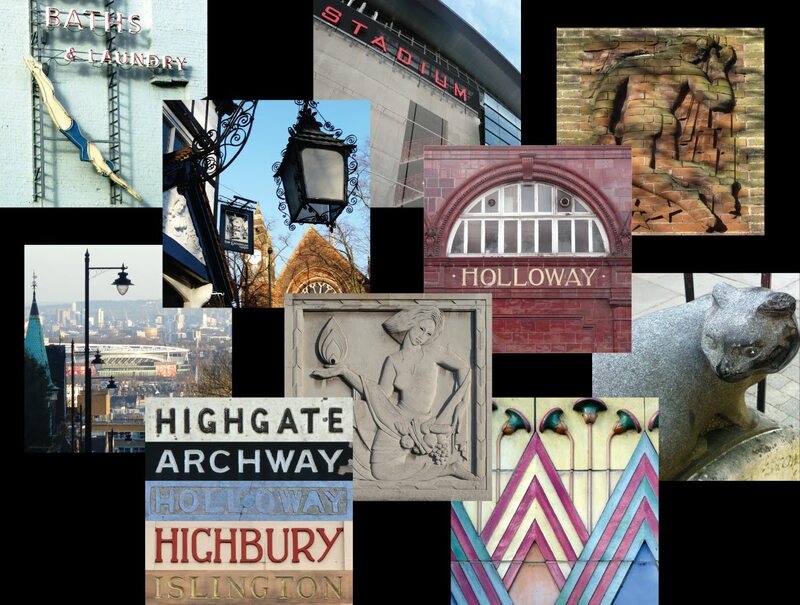 The whole area is steeped in history, John Sainsbury, the founder of the supermarket chain was born in Oakley Street (now called Baylis Road), he learned his trade as a costermonger in the market. The first Pie and Mash shop started in Union Street nearby, the first music hall (the Canterbury Arms, was in Westminster Bridge Road opposite what is now the Walrus Bar. The barrows you speak of are from a family called Tappy who resided in Fitzalan Street just off the Lambeth Walk, they came from a family of Wheelwrights which makes sense, I have been in touch with some of the remaining family members. Some of the barrows were bought off Lambeth Council in the early eighties by the BBC, and are still used today on the Eastenders outside scenes. And also you asked about what was under the red paint on the side of the Camel and Artichoke bar, it used to say 'Streets', which was the name of the bar before it's present name. Before that it was called just 'The Artichoke' and had been called that for the last two hundred years (there's a painting by Paul Sandby painted in the late 1780's that shows people outside when the area was a village). If you would like to know anything else or if I can help you please get in touch. Thanks for taking the time to write the above. I am a bit rushed at the moment but when I have time I will look at your old blog.